Here is a rarity: a low-budget horror movie that doesn't feature any zombies! Not only that, but it is quite decent as far as straight-to-DVD releases go as well . . . Think The Thing set in a small town supermarket instead of the Artic wastelands and you will have a good idea of what to expect of Alien Raiders. Late one night a group of armed gunmen take over a small Arizona town supermarket and start shooting hostages at random. It however isn't your standard robbery. The gunmen are actually a group of discredited scientists who are trying to stop an invasion by alien organisms that ?possess? its human hosts. They have tracked the last of the invaders to at this small supermarket and this is the night that they can end the whole thing. But then things start going wrong: there is a gunfight, the cops arrive and soon we're in Dog Day Afternoon territory, except instead of Al Pacino we have shape-shifting aliens . . .
Part of the fun in Alien Raiders lies in guessing who is human and who isn't. Sure, it has a "twist" ending that one can spot a mile away, but clocking in at a brisk 85 minutes it is a fast-paced action horror movie that boasts some decent writing and gore special effects. For starters, thanks to some good casting the characters never feel interchangeable and the acting is pretty decent too. With no recognizable faces, except maybe for Rockmond Dunbar of Prison Break fame, we never know which "star" is going to survive the ordeal, which is a bonus. 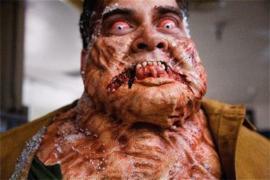 While there is some gore, including some gruesome finger severances, one also never feels that Alien Raiders is one of those typical low-budget zombie movies that merely serve as showcases for their gore makeup artists. THE DISC: Some trailers including one for the upcoming straight-to-DVD Wonder Woman movie, which looks pretty cool (yay!). The two making-of featurettes are short and not particularly in-depth. 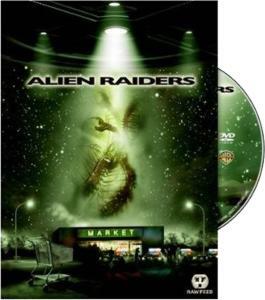 We for instance wanted to know if they used an existing supermarket or actually built one like they did for The Mist, also a fantastic horror movie set in a supermarket which will make for a fine horror video double-bill along with Alien Raiders. Unfortunately no such answers were forthcoming. The short bits on the aliens? physiology and so are on the dull side (the screenwriters thankfully never elaborated too much on the back story in the movie itself - too many explanations would have stopped the action dead in its tracks). WORTH IT? Forget the stupid title which makes it sound like a 1980s cheapie designed to cash in on two popular movies of the era, Alien Raiders is an enjoyable sci-fi / horror romp.